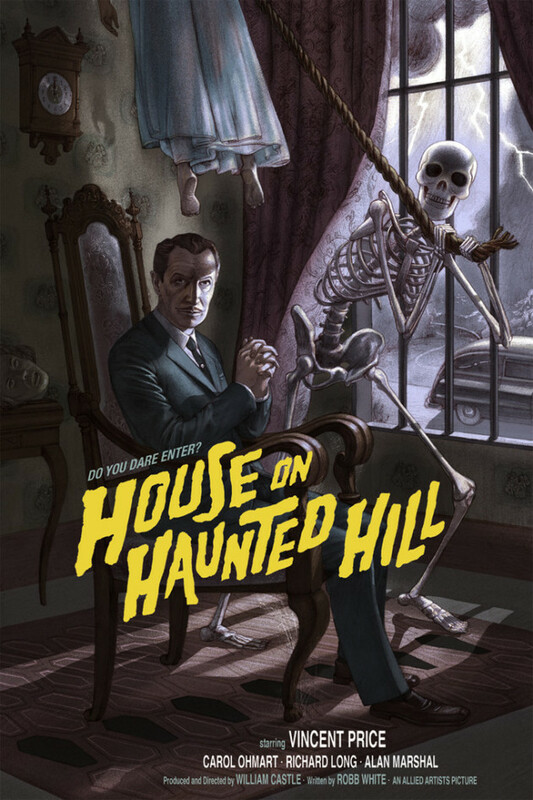 The original House on Haunted Hill is one of those horror classics that’s more famous than it is genuinely “good.” It has a 96% rating over on Rotten Tomatoes, but even many of the good reviews are quick to deploy adjectives such as, “cheesy,” and “campy.” Most people who’ve seen the movie probably come away with the same impression. It’s fun, even memorable, and has some good, spooky ideas and moments, but for the most part it’s also shamelessly silly. Not that there’s anything wrong with that; not every horror flick should be an earnest affair. 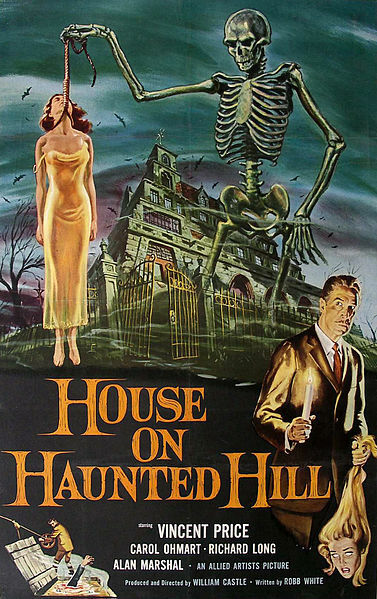 House on Haunted Hill was one of William Castle’s many gimmick-driven fright flicks, and it’s perfectly fine with being a morbid joke. Fitting with that vibe is the above poster I came across that’s up for sale now on Mondotees.com. The suggestion of the woman hanged by a skeleton is certainly grim, but it’s actually an homage to the original poster, which was far more macabre, as you can see below. The new poster–created by Jonathan Burton–is more coy about presenting the actual hanging, which makes it a bit grimmer by suggestion, though not as directly gruesome. The stiff woman in the original poster looks more like she’s just posing on her tip-toes. 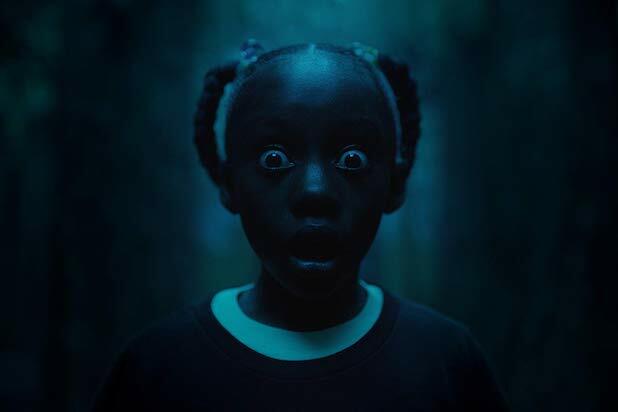 The partial view we get of the woman in the new poster has a sort of weightlessness to it that makes her look like she might be either a swinging body, or a floating spirit reliving its demise. This new House on Haunted Hill poster also comes in black and white. I’m not really the type to decorate my home with movie posters, but I appreciate them, and were I the type, I think I’d go for the black and white version. I really like that poster, but you’re right about the movie. I love Vincent Price though.